Well, yes - so sorry about that. A bit like buses, none for ages, then several come along at once. I must admit that a 101/J15 was not on my radar, as they never appeared on the SLNCR and my proposed branch to Arigna Town has been, thus far, a joint line with the MGW. However, acquiring Richard's 0-6-0 Shannon set me thinking. Arigna's fiddle yard is full, but what about back dating things, to do two distinct periods? At home, I can run what I like of course, but it is not unusual at shows to see layouts that will change, say, from steam to diesel - either half way through a day, or on separate days for a weekend show. Hence, when the chance came at Telford, back in September, to buy an unmade TDM kit of a 101/J15, it was an opportunity I wasn't going to refuse. The plan is to model trains around the turn of the century. Shannon was built in 1900/01 as is resplendent in WL&WR lined black. 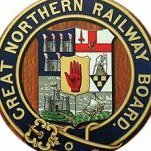 The GSWR took over the WLW in 1901, so my 101 will be in lined black livery and with the MGW also working into Sligo, the opportunity for all three companies' locos to appear alongside each other is far from impossible, though how that will eventually come about, you'll have to wait and see! Given that I've had the kit for a couple of months, why wait until now to start it - after all I'm not one to leave such things on the shelf? 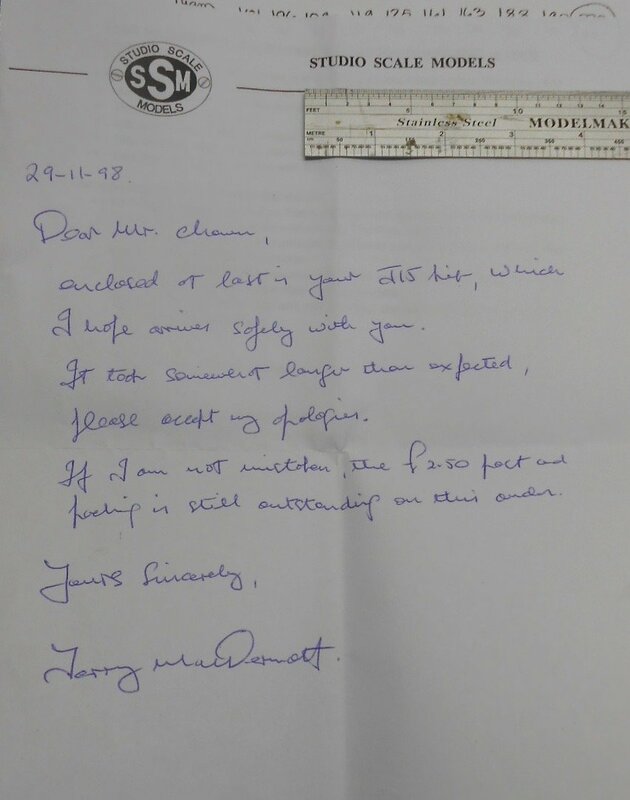 It all revolves around what was in the box, which included a letter from Terry McDermott [of TDM Models/Studio Scale] apologising to Richard for the delay in supplying the kit. The letter [see below] was dated 29th November 1998, so it seemed appropriate to make a start on the 20th anniversary of it being posted. I presume the kit was photo-etched and therefore is a blown up version of the ones currently being shared elsewhere on the Forum. Good news for me, because I have all that expertise to lean on - including the history of these locos, so many thanks to all concerned. It is interesting to ponder just why Richard never got round to building the kit and why it stayed unopened for 18 years, until his death in July 2016? Was he busy with one of his many other projects? I can't imagine a modeller as resourceful as him would have been put off by the need for extra components, so perhaps we will never know. Anyway, today I have made what is more of a token gesture in starting the kit, by cutting out the frames and using some 4mm brass rod as temporary spacers. Hopefully, after Saturday, I will have most of the key components I need to get started properly. Saturday is the Reading 0 Gauge Trade Show, a splendid gathering of major and minor traders, where I should get what I need. The kit doesn't actually contain any frame spacers. In the 4mm version, brass rod is used. 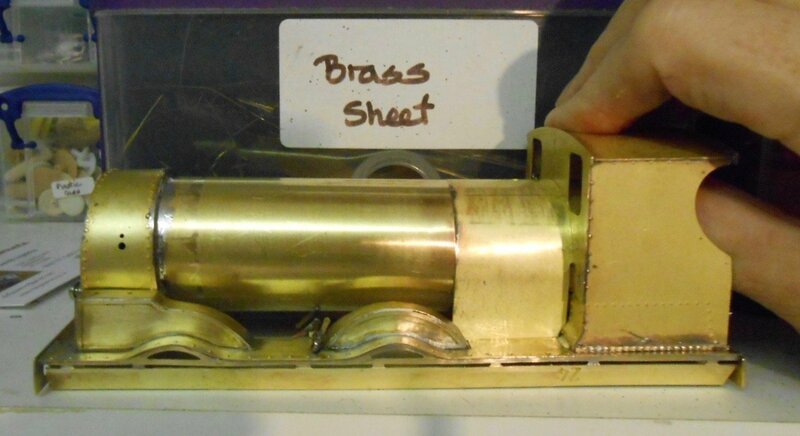 I am planning to make my own from brass sheet and along with various brake rods, this should ensure a rather flimsy pair of frames become properly solid. I haven't decided yet whether to add springing - partly because none of my other locos have it, but also because I'm not yet sure about working inside valve gear. It would be nice [if expensive] to fit it, but I don't know if it can work on a set of sprung centre drivers. Am sure Lawrie Griffin will put me right on Saturday. You can see all the additional stuff I need in one of the photos. The kit is more at the Worsley end of things in that it is only etchings, but at least there is a good set of instructions and a 7mm scale drawing. 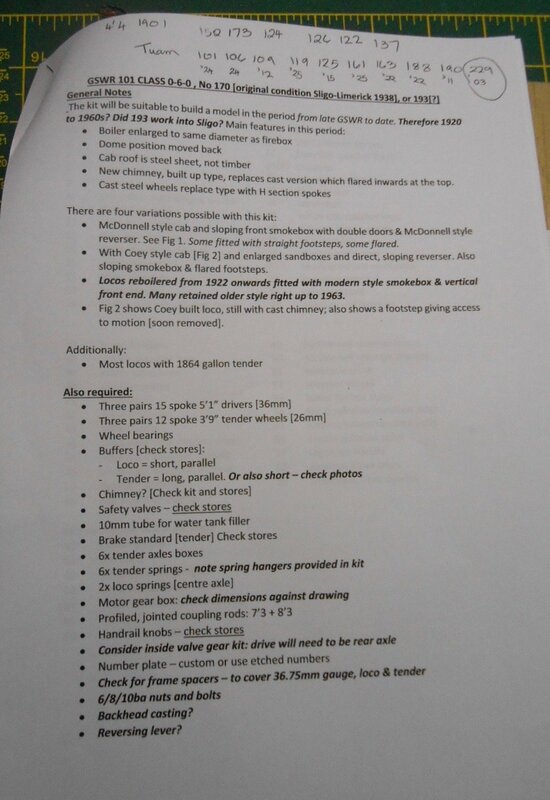 That said, I have re-typed the instructions [8 pages!] in bullet point form. This can be a useful exercise anyway, as it gives you an insight into any extra required and gives an idea of how the model is intended to be built. Apart from things like chimney, dome, buffers, axle boxes etc, I'm hoping to treat myself to a set of profile milled coupling rods from Premier Components. These are a big improvement on sweating two or more layers of thin brass together, plus they also do a nice line in machined motor gearbox combinations. Just a matter of making sure one will fit! So, there we are. I'll report progress from time to time, so please feel free to comment, especially on anything which is not correct. 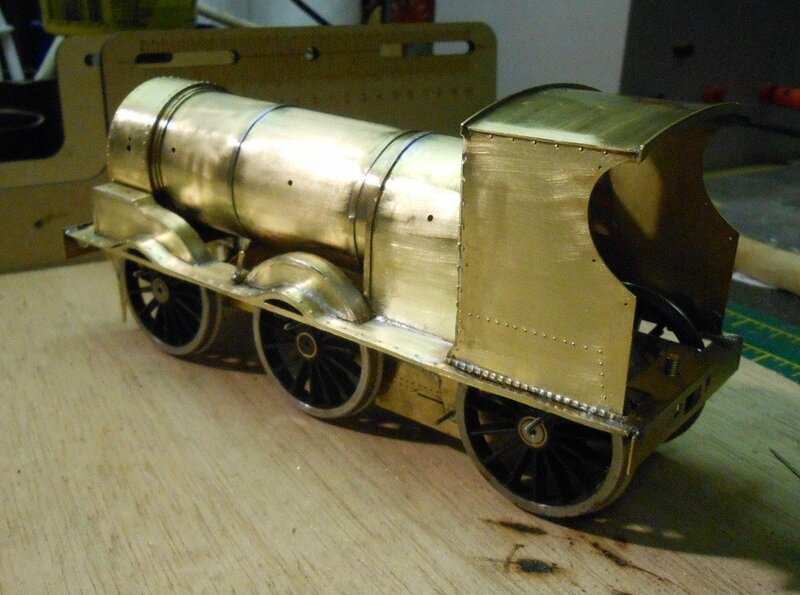 This won't be one of Eoin's specials, but as long as I can create a good looking model, which reflects the prototype and also runs well, I'll be happy and hopefully if he is looking down on me, Richard will approve too! Did Richard manage to sort out the outstanding £2.50? One would hope so, the compound interest over the last 20 years would be considerable. Nice little anecdote though! Love the overall/apron, especially the pouch for catching small items that get dropped. Must get myself one! What's the tap for though - recycling any spilled Guinness? That's the 'Dribble Bib' when one gets modelling excited! Well out of my league, but nevertheless, it gets quite expensive. First a visit to Premier Components, for a nice set of profile milled, jointed coupling rods, plus a Mashima motor and 40:1 gearbox. Seventy quid, just like that! A few stalls down and you come to Slaters. A pair of driving wheels is now £22 an axle, so with tender wheels and bearings as well, another £110 gone. Just as well I found a set of Slater's buffers on Roxy's stand, because at £12, they are a good £10 cheaper than the Markits versions. Yes, you read that right... Thankfully a bag of other castings [whitemetal] weren't so bad, but my £40 kit is now running well over £250, but still not bad in this scale. When you think that a Dapol Jinty costs less than £200 and wheels/motor/gears alone could easily make up more than half of that, recent RTR 7mm scale models look a bit of a bargain. You don't get the fun of building them though! Speaking of construction, I also bought a Poppy's Woodtech loco cradle. In laser cut MDF, the kit glues together in 5 minutes and has already proved its worth in holding the frames together while I soldered in home made [29mm] spacers. 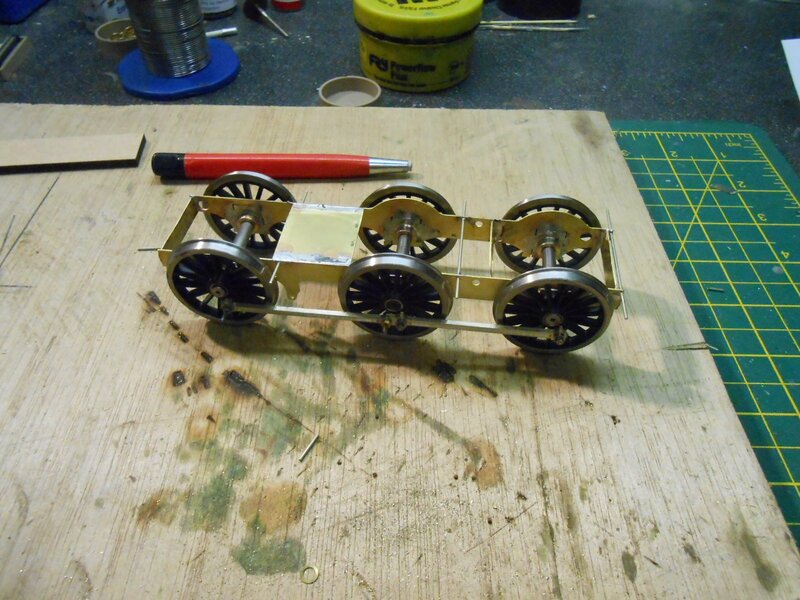 A photo shows that I already have a rolling chassis, though there is a small problem with the milled rods. In the past, I'm sure the joint was a rivet, but what's been supplied is a steel pin, that is actually too short to solder a washer on. Any thoughts out there? 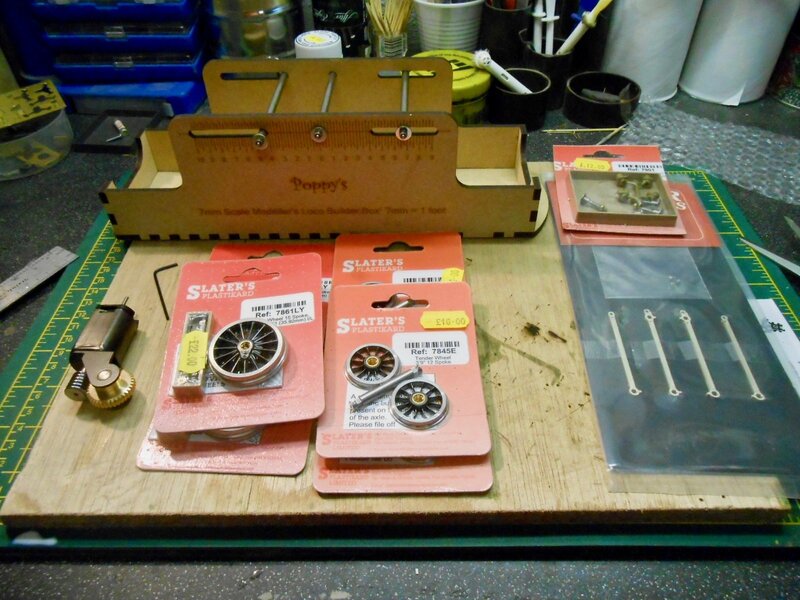 I have the Poppy;s loco box for 4mm which is excellent for construction of chassis - it does give plenty of space around the frames for soldering. My understanding of the pin with the coupling rods is that it's a simple rivet - you have to take care not to peen to tightly? For the 0-6-2T I'm working on a the moment, I ended up using a track rivet as the rivet to hold the coupling rods together which worked rather well. You only need to use a peened rivet if your chassis is sprung or compensated, your chassis is fixed so I would solder the back of the rivet and the join ensuring the rods are straight first- you may need to file the back of it down after soldering, depending on the clearance to the wheel! Thanks Eoin & Ken - it was probably around 5am this morning that this came to me. As you say, why have hinged rods on a rigid chassis! 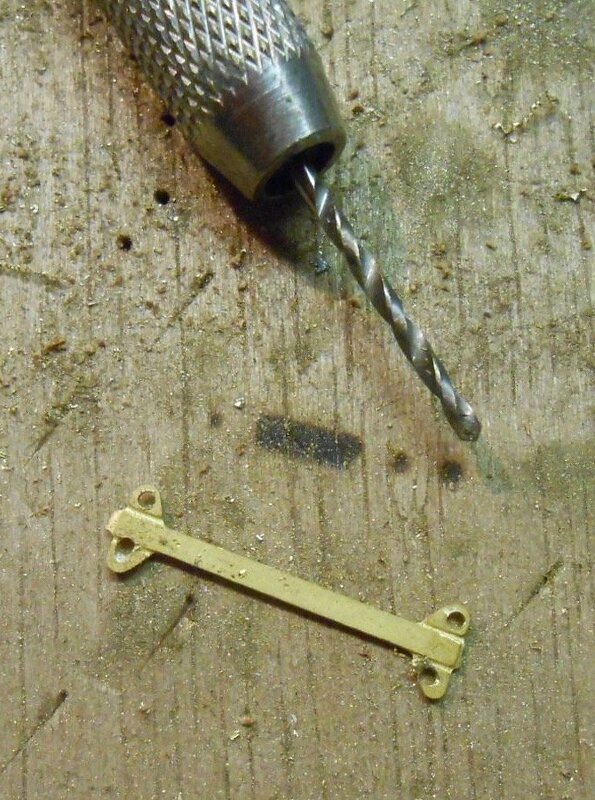 It was because the rods come in two parts, that made me think they needed to be jointed, but it is a pin, not a rivet that is supplied, probably to make sure a four coupled set up works first, before adding the second pair? I've got a set of Slater's sprung horn blocks waiting to be used, but the 101 frames are pretty flimsy, even in 7mm scale. They do have half etched cut outs for horn blocks, but the Slater's ones are 2mm wider than this, which makes them actually wider than the bottom of the frames. So, solid chassis it is. At the moment, not sure whether to go along the full, inside working valve gear route, or make do with 'dummy'. 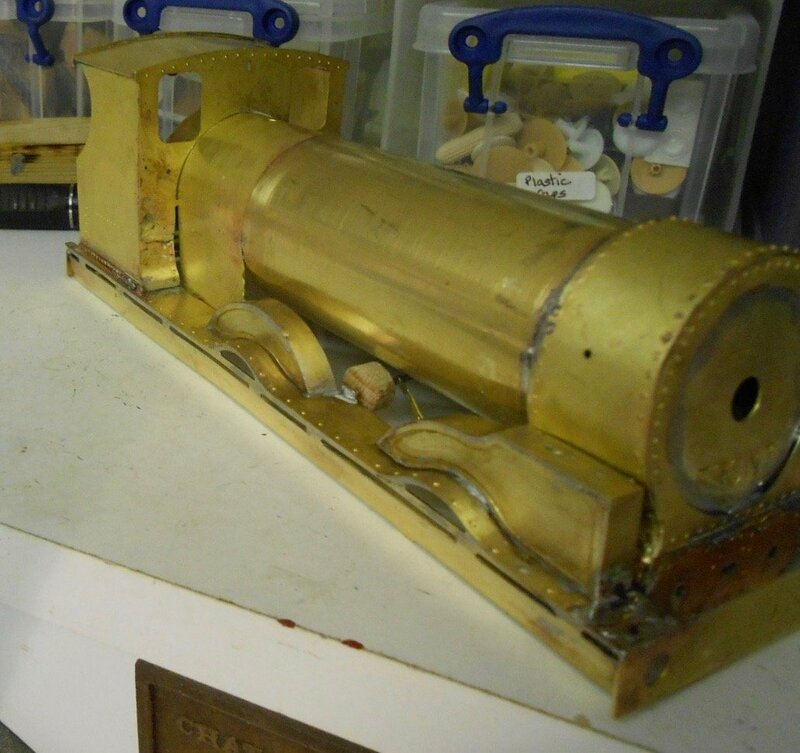 My SLNCR 'Sir Henry' has Laurie Griffin's working inside valve gear & I was pleasantly surprised how easy it was to build. Getting on for £100 though, so not to be taken lightly. Guess it will depend on how visible it will be be, especially as dummy motion is easily made from plastic strip. There is no doubt that, structurally, the 101s are complex beasts, especially as regards the footplate area, with splashers over both coupling rods and wheels. Fortunately, Terry McDermott has included some clever design features, to help make lifer easier. 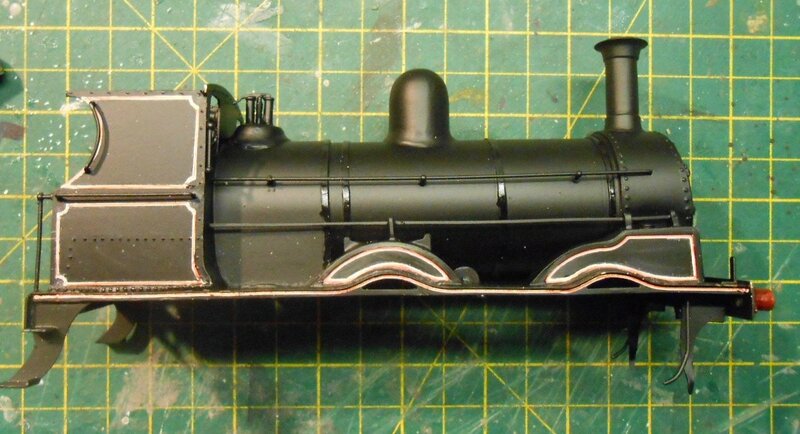 The footplate on its own would be incredibly flimsy if cut out on its own. Instead, you are told to leave a lot of etching attached in the middle at first, to retain strength until other parts are added. The second photo shows progress thus far, with just the valences attached. Again, very flimsy, but the etch has a strengthening piece attached and it works well. A clear sign the kit maker actually built his product - not always a given, I'm afraid, but very welcome. So glad I'm doing this in 7mm scale, am more than a little impressed with its 4mm brethren. The kit was designed by the late Eamonn Kearney an active modeler who worked to S4 standards, he designed the majority of the TMD and SSM loco and coach kits. From memory Terry McDermott was mainly interested in pre-group Midland Railway in 7mm scale, I had a look at the test build of the J15 in Terry's house before buying the kit. The J15 was one of the first TMD kits to incorporate elements of slot and tab and modular construction, quite advanced by the standards of kit design in the early-mid 1980s. We seem to have taken opposite directions in assembling the running-board, I retained the temporary splashers and removed the central section with my two locos. Thanks John. Credit to Eamonn then. I once built a Gibson GER E4 that had clearly been blown up from 4 to 7mm scale, enhancing, if that is the right word, a fair few dimensional errors. Taught me a lot in a way, because I had to make several new body parts and use rather more filler than I wanted. Early days yet, but the fact that a set of bought in profile milled rods matches the etched chassis is promising. Presumably the kit was hand drawn, unlike the CAD stuff of today when resizing much less of a problem. Just following the instructions for now and will be glad when I've got that footplate finished! I have built 2 of these kits, one in 7mm and in S Scale. They are a great design of a fine loco. I would like to clarify that they were designed by Terry McDermott. I have the original paper artwork drawn by Terry, which was then used to produce the photo-tool for etching. 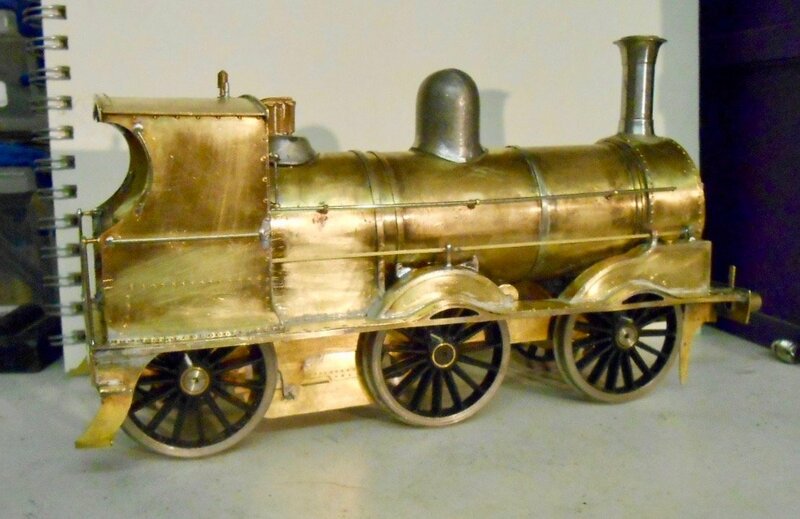 It is a brilliant piece of design by Terry and has all manner of additional parts for different cabs and splashers to do the original and later Coey versions of these very fine locomotives. Good luck and enjoy the kit David! Best wishes, Paul Greene aka Broadstone. Thanks Paul - Find the history of such things fascinating. Presumably, there was no CAD when Terry created the kit? If so, it was real state of the art for its time & stands up very well indeed against more recent kits I've built. Have managed to get the footplate area built. There curved sections certainly require patience! 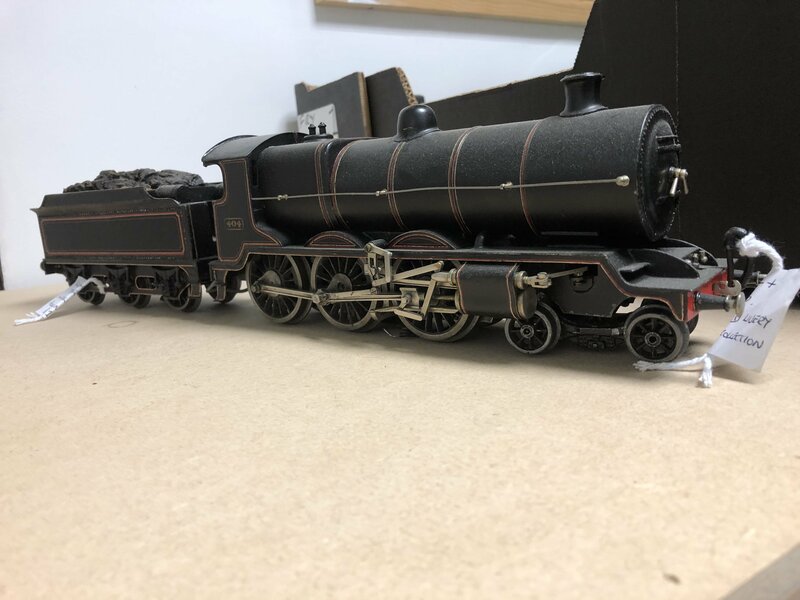 The latest photo shows it attached to the frames, to check clearances & again appreciate how much tighter things must be for Mayner and his 4mm scale models. Probably less than a millimetre clearance in 7mm scale, so down to fagpaper in anything smaller. I still like the 101 kit, a lot, but no matter how well things are drawn or how good the instructions, there is always at least one part of a kit that causes furrowed brows and a few new constructions of Anglo-Saxon. And thus it has been today, so any advice welcome - Mayner, Andy, Paul, especially! It is those lines in the instructions you love to hate. In this case 'the shape of the firebox may need adjusting to fit the spectacle plate; after join the firebox and boiler'. 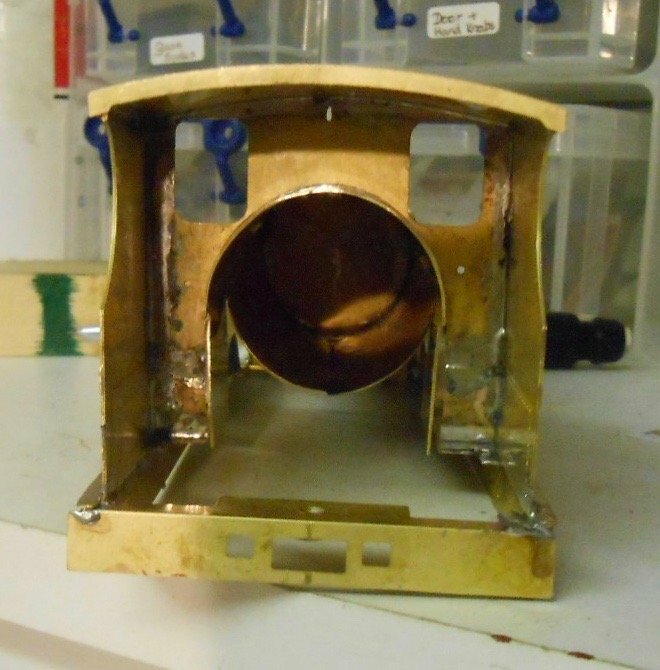 Firstly, no mention that the boiler is a piece of rolled brass, that has not been joined. This not a problem, as soft iron florists' wire holds everything in place while you solder up the seam - been there, got that T-shirt. Better to use a higher temperature solder too - in my case 240 degree as opposed to the 145 I use for most things. However 'joining the boiler to the firebox? Is is supposed to overlap? Is it a flush fit? And if the latter, why wasn't a single, rolled piece provided instead? My ability to put things together back to front is well known [to me at least], but it still didn't stop me doing a dry run with the firebox the wrong way round. Eventually, realised [I hope] that the half circle bit goes inside the cab, resting on the two lugs on the spectacle plate [see photos]. Checking drawing and photos, my impression is that the firebox should be flush [not overlapping] with the boiler, so I added three strips of brass to the firebox to help align the two. Again, can only hope I'm right. Fairly confident here, as otherwise, when the boiler is lined up with the smokebox, it slopes downwards towards the front, so clearly wrong. 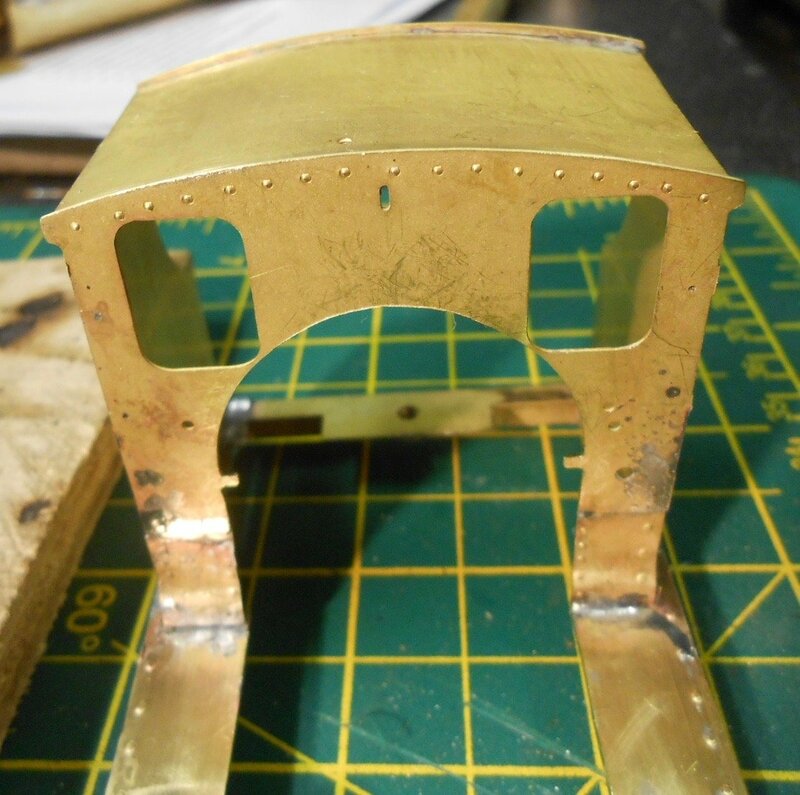 Even so, to get the boiler to sit level with the smokebox, I've had to file a bit of the spectacle plate, in order to raise the height of the opening which takes the firebox. This way, I can [just] get it to sit level, though there are a few gaps that will need filling. This leads to my other conundrum. 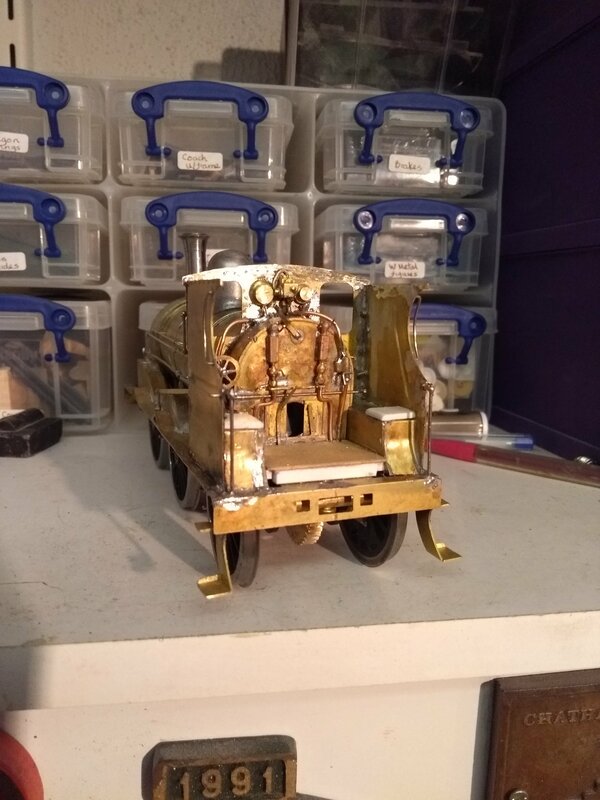 The smokebox is fitted to the footplate by a captive nut & bolt - ideal in terms of having the smokebox/boiler/firebox assembly removable for painting. The problem is how to bolt the firebox into the cab? Any ideas welcome here, though I fear I may have to solder the who thing solid as I can't at the moment think how I will otherwise fill the gaps the kit [or more likely my bodging] have created. It is still a good kit though, one that is proving both interesting and [mostly] very enjoyable to work with. The basic shape is coming on nicely and [fingers crossed] the body sits well in the chassis with the motor gearbox pretty well hidden. As far as I remember TMD loco kits were supplied with a boiler formed from brass tube, I did not realise the 7mm J15 was supplied with a boiler. The top of the firebox and boiler are flush on locos with the 4'4" boiler, I usually use a strip of scrap brass curved to the inside diameter of the boiler to provide a seating for the firebox/to reinforce the firebox/boiler joint on locos with round topped boilers. I have not noticed the issue of the boiler being higher at the smoke box with my earlier locos, I still have to assemble the smokebox for one of the new locos. I like the idea of a removable boiler for painting, I am planning to fit the firebox as a sliding fit into the spectacle plate at the cab end with the existing bolt fixing at the smokebox end. I forgot what I did with my earlier kits the footplates and boilers have not been separated in over 20 years. 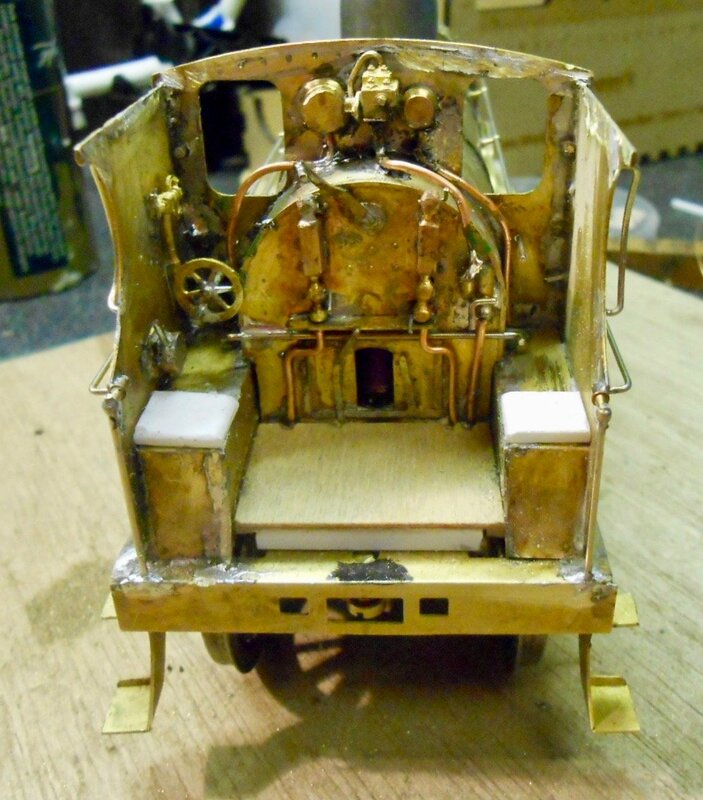 The builder of the "white engine" cut the firebox off flush inside the cab and may have soldered firebox to spectacle plate and running board. Hi David, you have worked it out and done it right - the boiler and firebox are indeed flush with each other on most of these locomotives. Earlier ones had a smaller boiler and therefore a step up to the firebox, while later ones with Z boilers had belpair fireboxes, superheating, piston valves, the works in fact! I think that Terry's idea was that the boiler and firebox could be removed for painting. It looks to be yet another good job David! 1. Firebox - yes it needs fettling and poking to get the firebox to fill the cab cut-out. 2. Yes, clearances are tight in the splashers. On my S Scale model I have some 5 thou plasticard inside the splashers to prevent shorts, necessary because of compensation. You should get away with it because you have a rigid chassis. You clearly have more level track than I am capable of building!! Here is an idea to keep from soldering the boiler in, I would try to keep them separate, though you have to consider the fixing of backhead also! 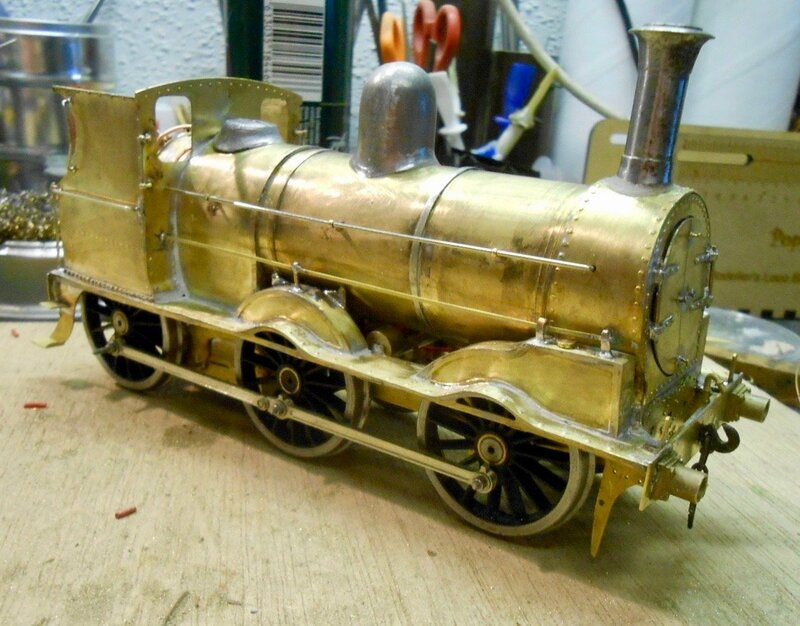 Especially like John's idea for joining firebox and boiler - far more elegant (and obvious) than my rather botched effort. Likewise Eoin's suggestion for fixing firebox to cab. Unfortunately, fear I may have to solder it all up as a solid unit that end, unless I can think of a way of filling in all the gaps and still make the unit removable. Both methods are now stored away for next time! Also good to know the boiler/firebox was indeed flush, Paul. I have a cast white metal blackhead that may get used instead of the etched bits supplied. Just depends on how it fits between the splashers. Still a long way to go though, for there is a wealth of fine detail to add, plus am still undecided whether it is worth fitting inside working valve gear. At the very least will add dummy motion, just depends on how much is visible once boiler/footplate and frames are attached. So, first of all strengthened the frames by adding in 4mm brass rods at each end, then added a front to the ash pan. Course, the brass rods lined up exactly with the captive nuts on the footplate, so the former had to be drilled out to take the 6BA fixing nuts. Next had to unsolder the cab/boiler/smokebox and start again - which of course meant the footplate was extremely flimsy, as I'd cut out all the strengthening pieces! All in all, a bit of a b****r and as you can imagine, that wasn't all that was said. Anyway, it did [eventually] get done, but then had to be followed by a substantial clean up as excess solder had got all over the footplate and firebox. 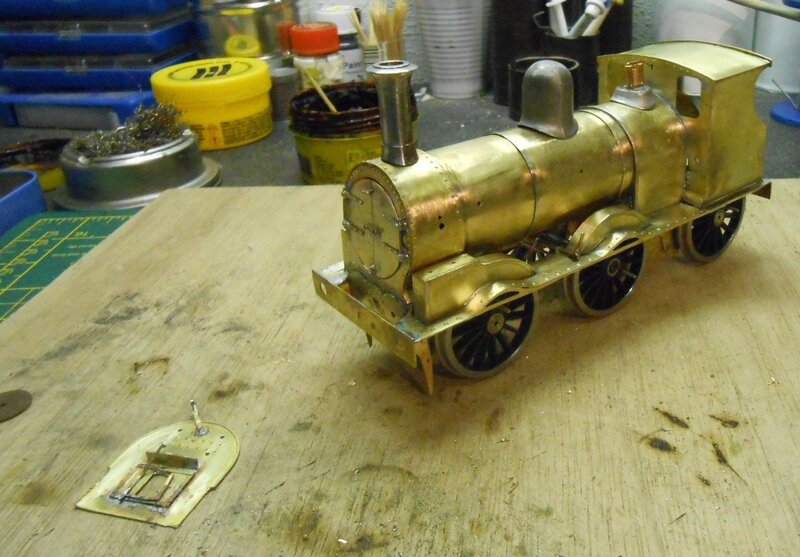 Since then, I've managed to add the details to the smokebox doors, though the latter's diameter was about 2mm too small in diameter, so had to make a new one by scribing round the original on some brass sheet and then cutting & filing to shape. 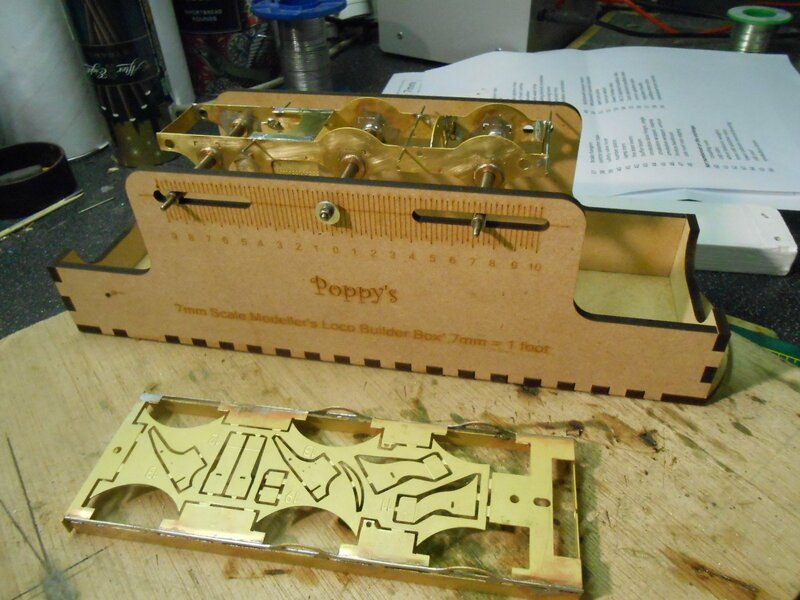 The kit only provides etches of the strapping, so the other details had to be source/fabricated myself. The two knobs/handles in the centre are heads from dress making pins, while the top and bottom handles are coach ones. The actual hinges were made up from brass bar and wire - the RSU coming in very handy here. Today, added the splashers inside the cab, plus the etched details provided for the backhead. Fair bit missing though, including gauge glasses, piping, gauges and the like, so will have to see what the spares box contains. Also had a look at the boiler mountings. The dome looks ok, but the chimney that was in the box [turned mild steel] is way too tall, so have shorted it at the base, meaning the latter now needs building up as it is now too narrow. Not sure whether I'll need to get a new one & am regretting not doing so at the Reading Trade Show. The safety valves were made up from two different spares - a whitemetal base and cast brass valves. 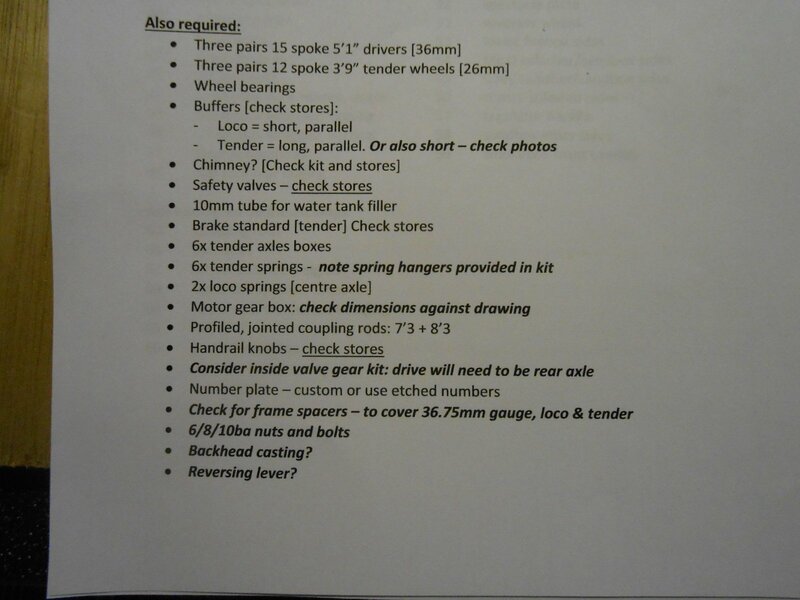 All these items can be seen sitting, unfixed on the boiler in a couple of the pictures. Given that Christmas TV is [as usual] looking pretty uninspiring, I may well take the opportunity to fill in all the holes from my enforced rebuilding - there are quite a few [! ], so some filing and sanding is now needed. Normally, Christmas and New Year is a productive modelling time for me - a more than useful distraction from what's on TV. However, we were away from home a fair bit, so it's taken until this week to properly get started again. I'm developing a bit of a love/hate relationship with this kit, for it is certainly challenging my skills and there have been several 'one step forward, two back' stages. The latest was the Horlicks I made with filling some of the gaps - somehow putting on far too much, which then led to way more filing, sanding and scraping than I needed. Adding the fine details has been 'interesting', shall we say. 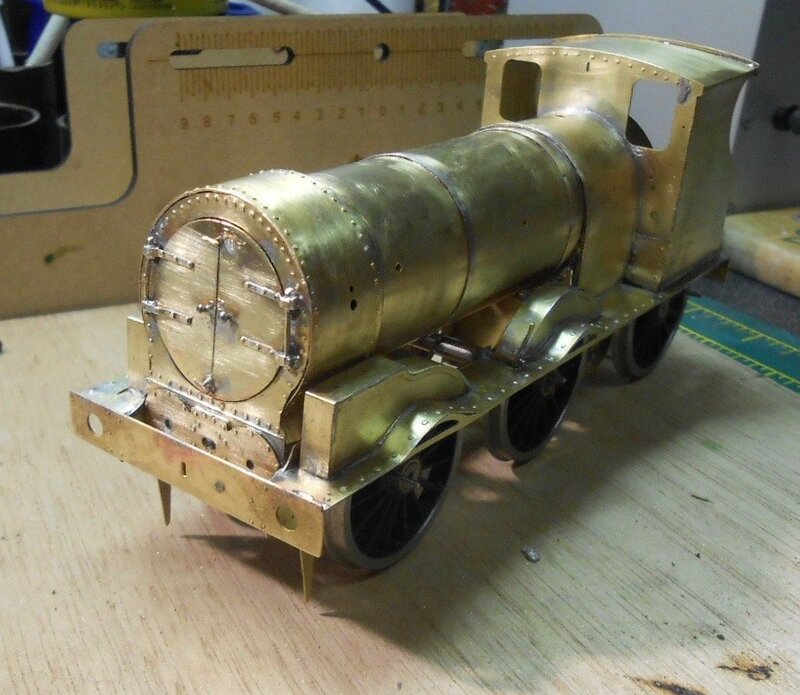 For example, I can't remember building a loco kit with so many handrails! The are four on each side of the cab, plus the two along the boiler, plus another on the smokebox [the latter pending as I don't have any short knobs], so eleven in all. Add in another pipe down the left side of the boiler, plus sanding rods either side and it all adds up to quite a collection. My RSU has been very useful for much of this detailing work. I tin each component & then can hold it in place with the probe while operating the RSU with its foot switch. Another area where the RSU has helped is the cab 'backhead'. 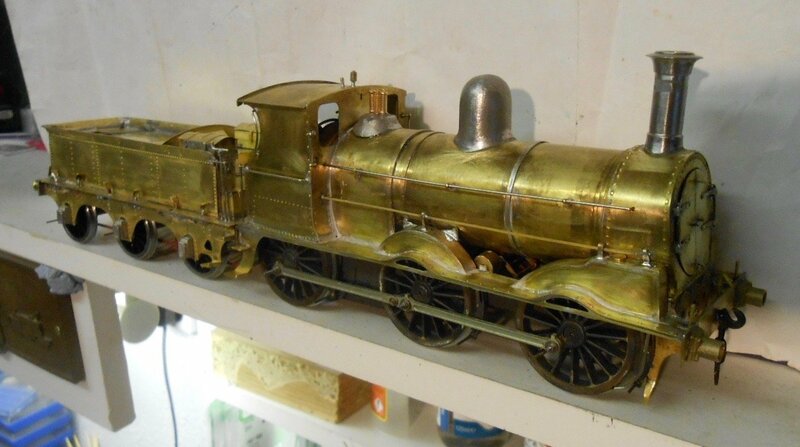 This is an area where a few castings would have been helpful, though at least the etches included things like firebox door, shelf and regulator handle. The 'Steaming Through Three Centuries' book has a nice colour picture on the top half of the cab, taken when the roof was removed for the film 'The Great Train Robbery'. Hence could work out a few pipe runs [copper wire], gauges and the like. 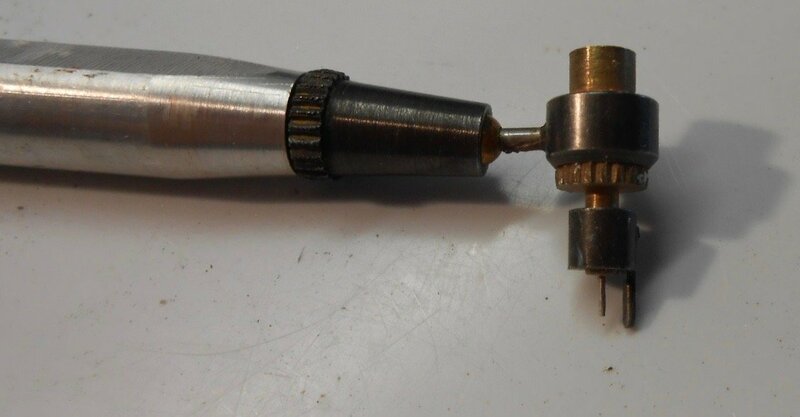 The water gauges were made from square section brass rod, turned & filed in a drill, while the two main pressure gauges are sliced from some solid brass lamp tops I found in the spares box. A couple of other controls were made in the same way. I tend to go for a general impression rather than absolute accuracy. Even in 7mm scale, a cab interior is still a pretty small space and once the crew are in place, you can't actually see very much. You can see I've also added most of the other main fittings. Chimney dome and safety valve casings are all glued in place with 5 minute epoxy, which I find ideal to make small adjustments while it is setting. More work needed on the base of the chimney though. You might also be able to see the coupling hook and vacuum pipe - the latter interesting in the it goes behind the buffer beam, where there is an open space in front of the cylinder chest. 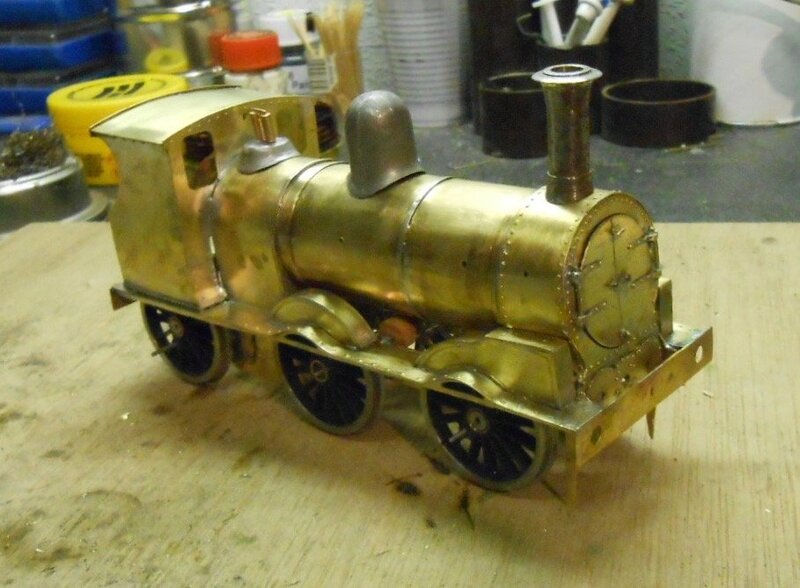 The loco body is not too far off the paint shop. Indeed, there is always a bit of a dilemma as to when to put on the first primer/witness coat. However, I'll probably wait until the chassis is also ready & probably the tender too, so I can spray everything at once. Finishing the chassis may well be interesting too - the brake rodding actually sandwiches the wheels, so care will be needed to avoid short circuits. Finally [for now], there a couple of pictures with my other J15 - a standard [narrow?] 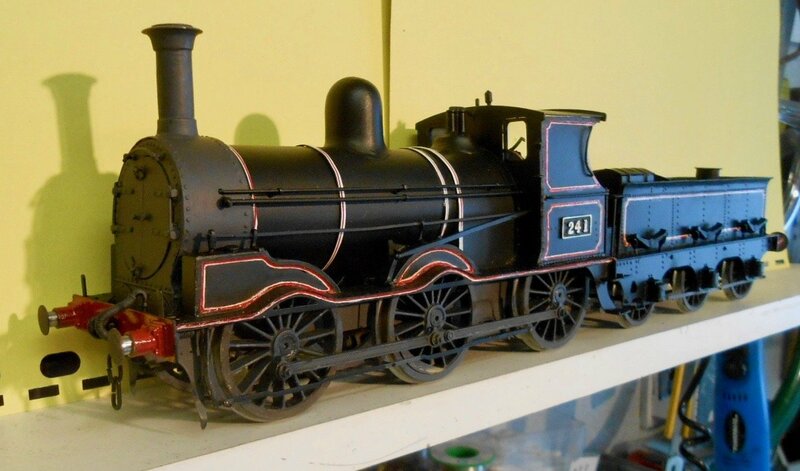 gauge Great Eastern Railway 0-6-0, I built several years ago, from a Connoisseur Kit. One of the nicest I've done in terms of ease of building & it even included some dummy inside motion. Though very different, the two classes of loco were similar in size & power and likewise in overall usefulness as the proverbial 'maids of all work'. More faffing around today. Have been unhappy with the cab, as especially on one side, it didn't look straight, even though a square suggested otherwise. Took a gamble and unsoldered the roof, so I could make some adjustments to the side sheet - managing to do it all without any details coming loose. I like the "narrow gauge" bit! As you can see, have managed to get on a bit of a roll with the 101 kit. Following on from getting the bodywork finished yesterday, focussed on the chassis next. I'd got as far as making sure it rolled nicely, with the rods attached, but moved to the bodywork to ensure everything would fit before going any further. Hence it has been a case of adding pickups and wiring back to the motor. 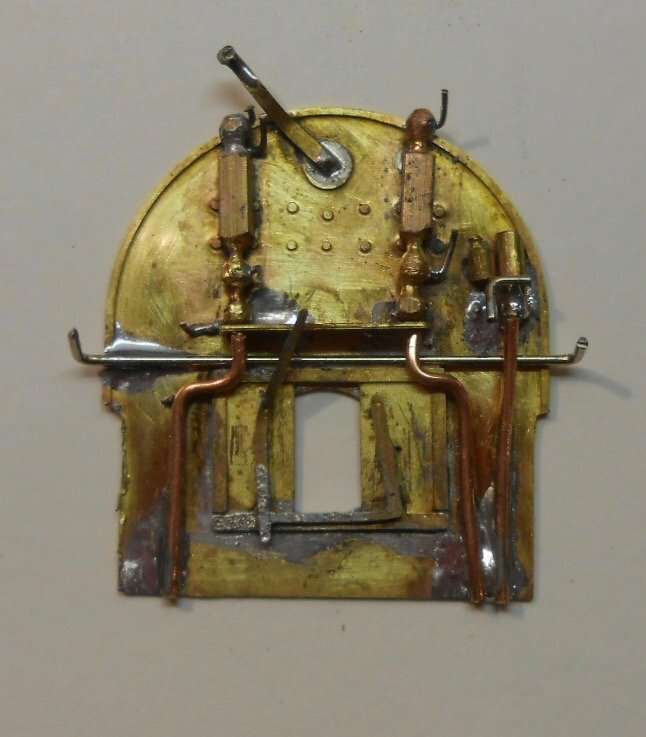 Pieces of copperclad were epoxied to the frames for the pick up wires, then phosphor bronze wires were soldered in place and bent to connect with the wheels. Much to my delight, the chassis still runs nicely, so next step was fixing it to the body [to check there were no shorts - always a possible problem with metal kits - and then run it on Arigna Town. Again, all was well, with the loco negotiating the points and curves without problems. Buoyed up by this success, this afternoon, I tackled the brake gear. Be it locos, coaches or wagons, brake gear is definitely not one of my favourite jobs and the 101's looked pretty complex. So it proved, though it has actually gone together quite well. However, I certainly take my hat off to John Mayner and others who have built this kit in smaller scales, because 7mm is more than fiddly enough for me! 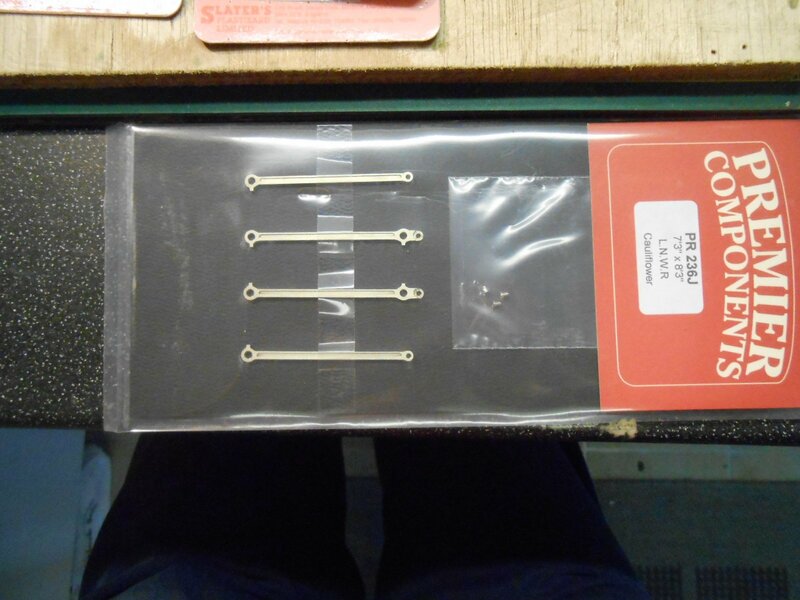 The kit comes with six etched brake brackets, which need drilling out to go on the cross rods. There are also 12 brake blocks, which are meant to be soldered in pairs to give the necessary thickness. However, there are pull rods on both sides of the wheels, so have decided to use some Slaters plastic blocks instead, in an effort to minimise the risk of shorts if any metal work touches the wheels. The brackets are hung on the top cross rods and were soldered in place. Nickel silver wire is then pushed through the lower holes and the pull rods then go on each side. I only fitted the inner pull rods, as the wheels need to come off again for painting. It was at this point that I discovered that the inner pull rods foul my newly installed pick ups, so they need re-positioning. The outer pull rods are just a push fit at the moment, so I'll need to think of a way to make them removable for maintenance. Fingers crossed, the chassis is now ready for the paint shop and it will be good to get this done so I can at last leave it assembled. No matter how many locos I build, it always seems I end up taking off and replacing the wheels more times than necessary! Pictures show the various stages, starting with a better shot of the cab interior and finishing with the disassembled chassis. I'm with you on the wheels on and off. Seems to happen more often that I think it should, yet I have yet to work out a solution to either leave them on or off for longer. I like to keep the coupling rods off until the very end as that just adds too much hassle. 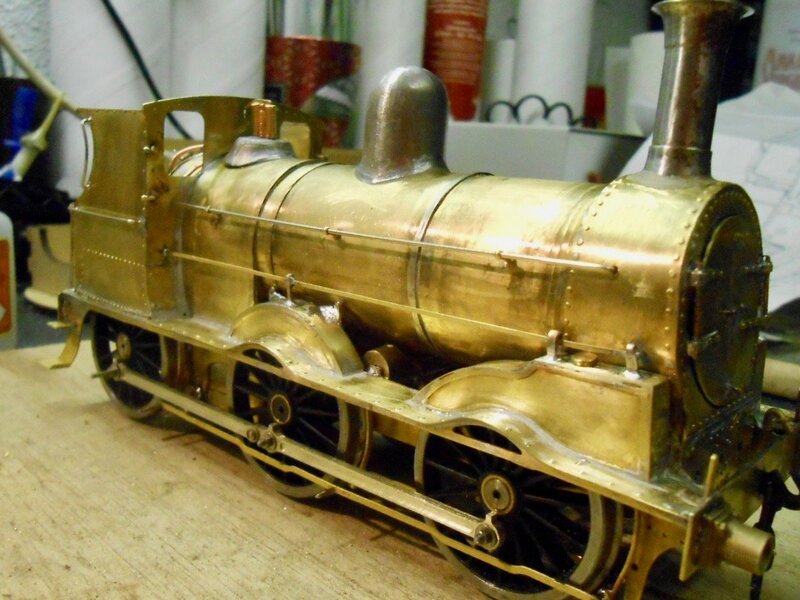 I'm interested in the frame spaces you're using - are they kit parts set for broad gauge, or something you fabricated yourself? As I am scratch building, frame spacing is of interest - I tend to keep the frames quite wide and use a slightly narrower spacer for middle axle, allow this axle to move a little more for curves. How are you handling axle side play for six coupled? BTW the backhead look excellent. I normally assemble the brake gear as a removable sub assembly, so that I can assemble the wheel sets, test and paint a loco before final assembly. Basically I solder all the lower connections between brake rods, hangers and stretchers but leave the top connections free so that I can remove the gear. I omitted the inner pull rods on 191 and installed a central rull rod to strengthen the whole assembly as the brake gear is practically invisible beneath the loco in 4mm. Thought you'd have some solutions, thanks John! The 4mm scale models are certainly impressive and it is really good to have a fleet of them in the various modifications. Ken, the frame spacers are simply 4mm brass rod. This works really well with my new Poppy's Woodtech frame jig. Guess you could do the same, or maybe go for smaller diameter? Clever idea to narrow the frames on the middle axle, by the way. The TDM kit is really just a set of etches, I assume Terry just enlarged the photo. Hence there are no frame spacers because the 4mm scale kits relied on square section brass spacers, with turned ends, drilled for the fixing bolts. At least that is what the drawings supplied with the instructions suggest. I'm sure there must be an official distance for frame spacers in 7mm finescale and there's bound to be in S7, of course. My first broad gauge loco was the Tyrconnel J26/E class. Here the foldup frames were for 32mm gauge. 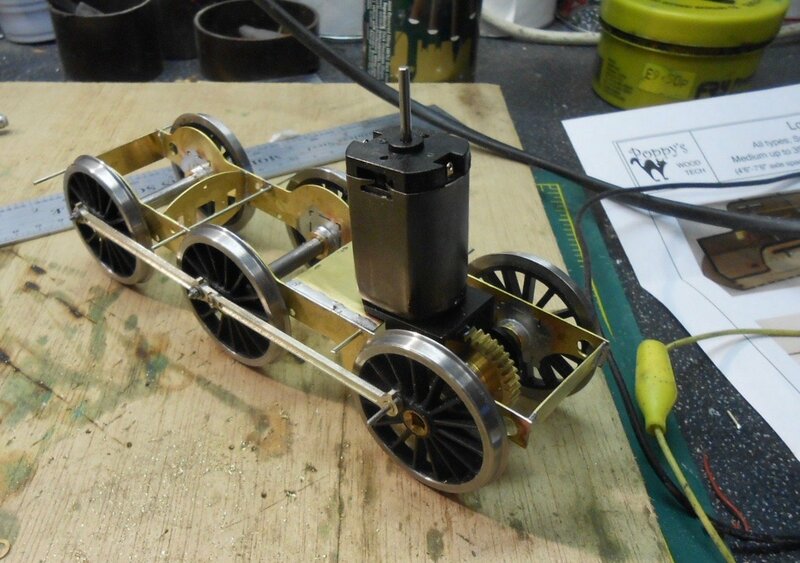 Roger Cromblehome suggests fitting the top hat bearings in back to front for broad gauge and this works well. On my own scratch building, I've used the same distance as the North Star kit of the SLNCR tanks, which is 29.5mm. This gives enough side play on the centre axles to go through 6' radius curves, with washers packing the outer axles. So, where was I? Is it really four weeks since my last post on the 101? An exhibition, man flu [far worse than bubonic plague of course], household chores and the like - they all eat into modelling time! 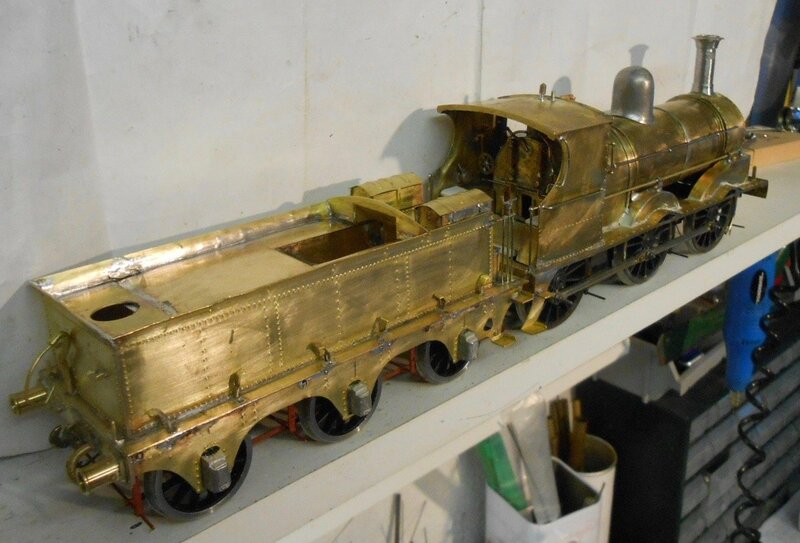 However, as might be gathered from other posts, work has progressed on the 101's tender and the model has now reached the stage where it is not far off the paint shop. The tender, like the loco, proved interesting, to say the least. 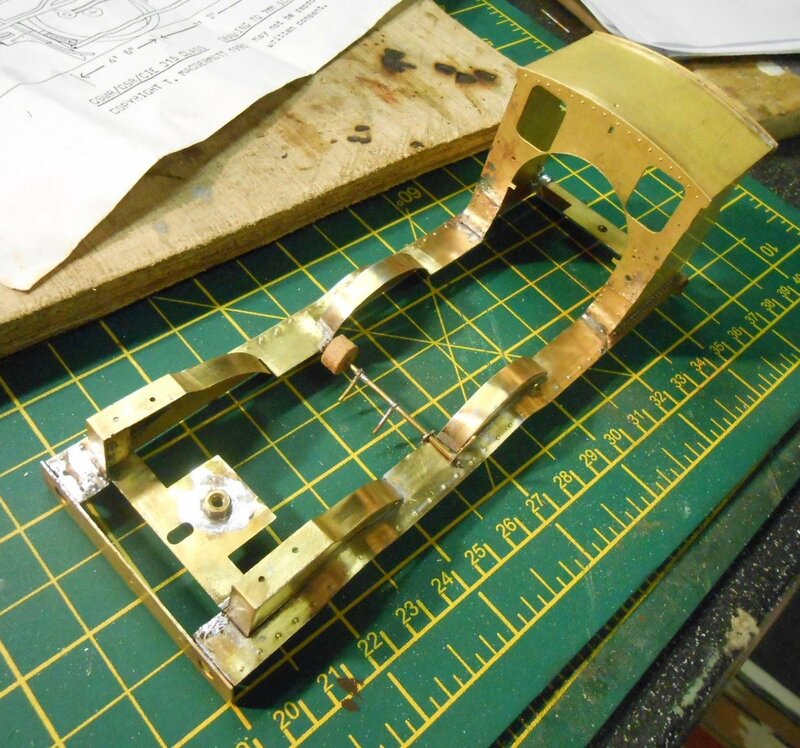 Frames were straightforward, with 5mm brass rod used for spacers, drilled to take 8BA bolts to fix to the body. At first, this was easy too, the only awkward bit being forming the flares along the top edge. The etches contain a fair amount of detail, including the distinctive tool boxes, plus all the brake gear too. Here is where it started getting complicated, with pull rods both inside and outside the wheels. The real difficulties arose in trying to work out what the original, 1864 gallon, tenders were like on top and at the front. 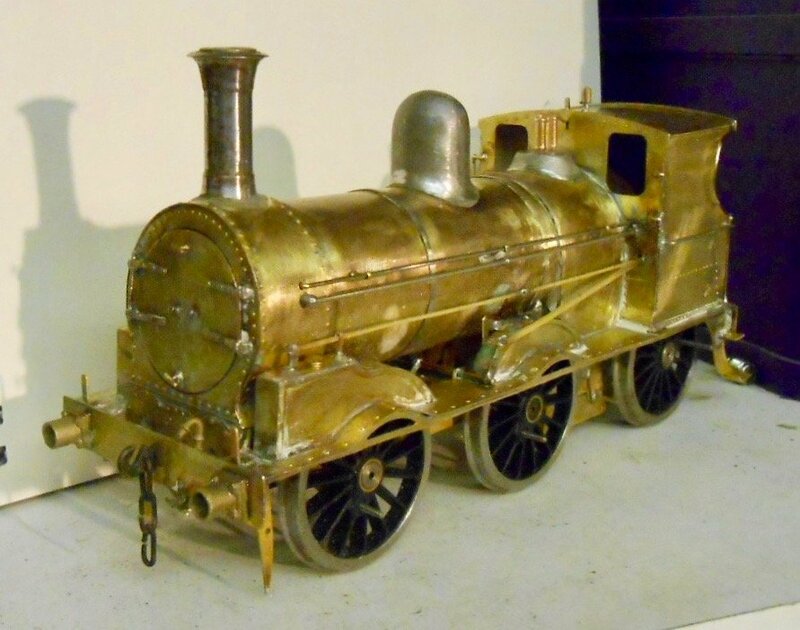 The instructions and photos are of the preserved version, while pictures in books rarely show more than three quarter views of the whole loco, so you are left having to guess what is going on elsewhere. The etches do not cover the tender top surfaces, while [to me at least], it was hard to make sense of the coal space. 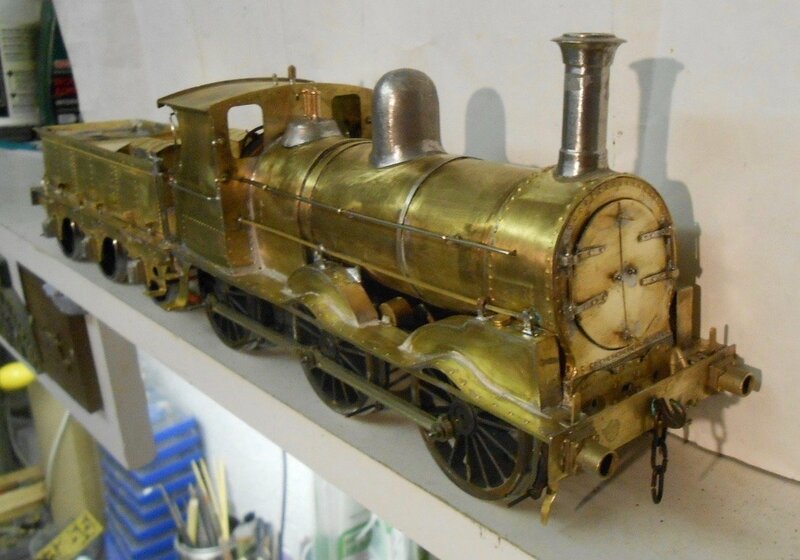 In the end, I fabricated both from thin brass sheet and it seems ok, while all photos show the tender top liberally covered with coal, so what is underneath hardly matters. Having bemoaned the number of handrails on the loco [eight around the cab alone], I then found there are a further four on the tender. The GSW certainly didn't want its crews falling off the footplate, it seems. 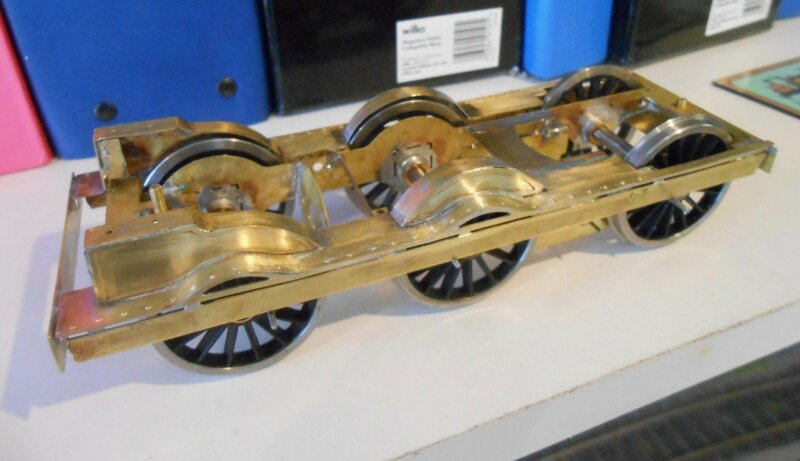 As with the loco though, there are no castings in the kit, so I had to source things like springs, axle boxes, buffers etc. I managed to find some suitable spring/axlebox castings at the Reading trade show in December. A fair bit of fettling has been required - separating spring from 'box and filing the latter so they fit in the outside frames. The springs themselves then needed hangers so they can sit on the top edge of the footplate. The etches contain plenty of hangers, but they are flat, so I soldered short lengths of 1mm brass wire to each 'leg' and then rounded this all with a file. This has meant I could drill holes in the footplate surface to take each of the 12 legs. The springs themselves will be glued in place with 5 minute epoxy, probably after painting, because otherwise lining the tender will be difficult. Several things can't be finished until I've visited the Roxy stand at the Tonbridge show next Saturday. A couple of short handrail knobs for the smokebox, a set of etched numbers for the number plates and some sub-miniature plugs and sockets so I can add pick ups to the tender. Hopefully, everything will be ready for priming by then, though this phase can be quite fraught at times. Witness coats do have a habit of showing up unwanted blemishes that then need filling and priming again, while cleaning up always seems to find a few weak solder/glue joints that need doing again. don't know about at the beginning, some are easy fixed some are not. When that is done, there is a wait of 24 hours before the top coat can be sprayed on - in this case matt black, then another overnight wait for that to harden too. Having built over 60 locos, all the above is second nature, but not the next bit! All my locos have been in 1950/60s livery in the past - black, with varying degrees of weathering, which can cover a multitude of sins. The 101 is going to be in almost 'as new' condition, which means lining, for which, as far as I can tell, no transfers exist, so from now on it is a very steep learning curve. 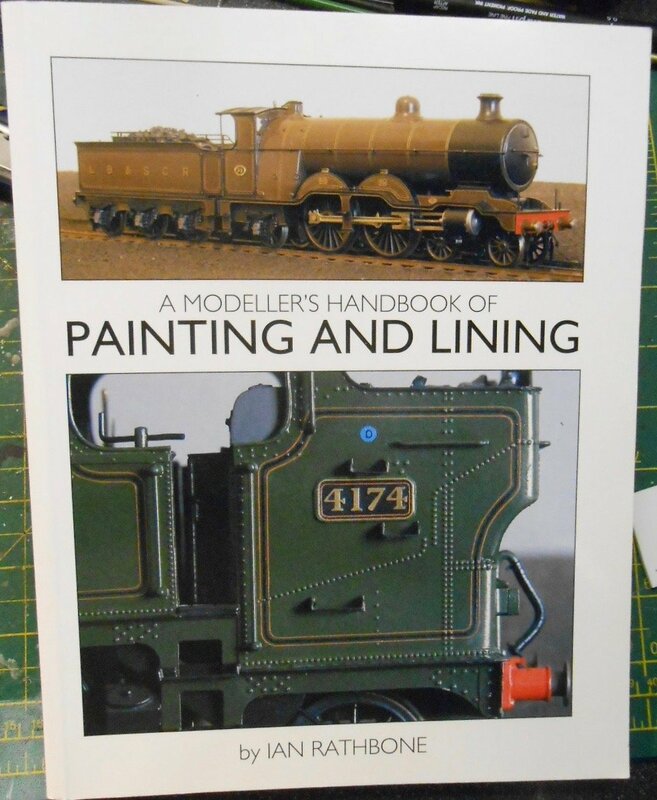 Thanks first to Eoin, for reminding me of my copy of Ian Rathbone's book on painting and lining. Have used it a lot, but had never read the lining chapters, until now, but they are very helpful, even if the results Mr Rathbone achieves are more than a bit intimidating. Just look at those cover photos - hand lined, with a bow pen and fine brush! So treated myself to a bow pen, bought some new fine marker pens, enamel and acrylic paints to go with my R L Moore lining pen and set about doing a bit of practicing. I also bought some plain white lining from Fox Transfers, to form the basis of the boiler bands. Having earlier sprayed a piece of plasticard black, I tried various ways of lining. Jonathan Beaumont kindly provided me help in the form of photos of one of Fry's locos, however I have to admit I've chickened out of trying to replicate it, because [for now at least], it is well beyond my skills and tools. Check out the boiler bands - white/black/red/black/red/black/white! Ok, so the white lines are outside the boiler band itself, but there is now way I can get a black line thin enough to go in the middle of the red one. So, what I'm attempting is a simplified white line, with a thinner red one down the middle. Hence the white transfers. Using red acrylic, I've managed to draw a red line down the centre, which hopefully will look ok once I've made the lining thinner. The next picture shows my first attempt at doing a white line on the tender. Not good! However, using white acrylic means that it can be tidied up by using a combination of scraping paint away with a cocktail stick and touching up with a fine, 3/0, brush. The corners were brushed in by hand and tidied as before, then once the paint had hardened, I then drew a thin red line down the middle of the white one. 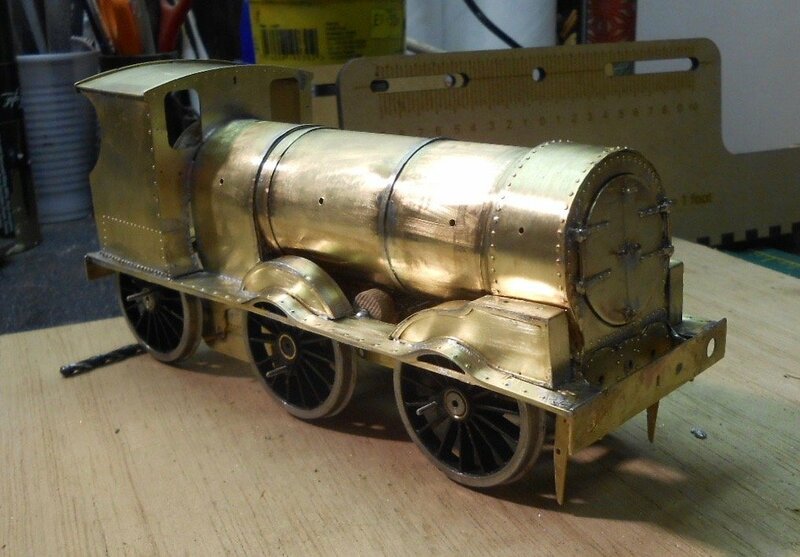 The loco body has had the same treatment, but all those curves are proving really challenging. The splashers and valances aren't too bad, because there is beading to follow, for the white line at least, but it is far from perfect. I've stuck with the bow pen, as the Moore one is designed for neat Humbrol. For me, a big issue is that the red is not drying dark enough. The actual colours, according to 'Steaming Through Three Centuries' should be vermillion, bordered with white. However, white looks far too bright against the dark black, so am using ivory instead. Vermillion is bright red, but on top of the ivory has a rather pinkish tone, so am looking to darken it somewhat. I think the real problem is I haven't been able to do the lines at scale width [they are very fine on the prototype], so probably need to invest in a better quality bow pen to achieve that. On the other hand, the lining is as fine, if not a little bit finer, compared to what Richard Chown achieved on Shannon, so at the moment, this is what I'm aiming for. It remains very much 'work in progress' though and until I've got all the lining on, plus numbers etc, I'm not sure whether it will overall look good enough. PS, as I feared, the phots have uploaded is the wrong order, but hopefully you can work out the correct one. Much of the last week has been spent on fettling the lining. In the end, I went back to enamels and persevered until I got a suitable 'double cream' thickness, as recommended in Ian Rathbone's book. My cheap [£12] bowpen can do reasonably fine lines with practice, but the key to success is the tidying up technique in the book. Essentially, one waits a couple of hours, then use a fine brush, dipped in thinners to ease away any imperfections in the drawn lines. Tedious, but effective & surprisingly therapeutic once you get into it. The trouble is that, every time you stop for a few minutes, when you look again, you see ever more imperfections. However, the lining is now looking better than it was and is probably at the limit of my current pen. I put in the white line first, then after letting it harden for 24 hours, did the red line inside it. There should be a further red line a millimetre or so inside the first one, but have chickened out of that for now. Corners were done freehand with a fine brush and tidied up as before. The last mentioned was a bit of a faff - as first I had to draw a thin red line down the centre of some white lining transfer strips, then [with much cussing and swearing], persuade the strip to go round the boiler & inside all the pipework, splashers etc. There are still a few things to do, not least fix the crew and put some coal in the tender. Made a fall plate this afternoon, which still needs painting & fitting, while the loco number needs to go on the buffer beam. 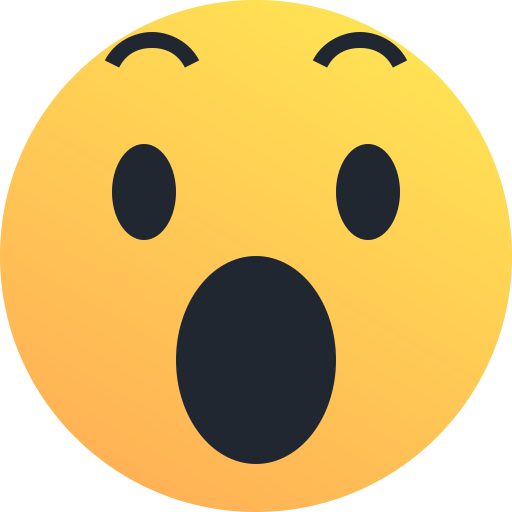 My best guess is that this should be in shaded gold or yellow. Having never thrown away a transfer sheet, you'd think I'd have something suitable. But no. Some Midland Railway coach lettering is about right, but there are only 1s and 3s, which is a bit of a bummer. Given the cost of a lettering sheet will exceed £10, I may well do the letters by hand. So, there we are - getting there, but even as I tick one more thing off the list, I notice something else: like this afternoon that there is no link between the tender brake standard and the operating rods below the footplate. In practice, a short piece of 1mm wire, but it will still need blackening & painting, so there's another half required. Life is complicated, which is why it's fun, as they say.